FANBOY PLANET.com . 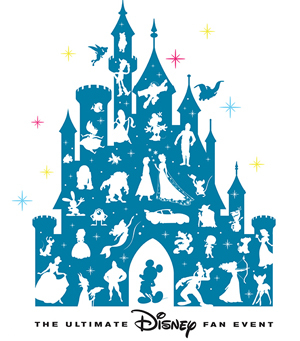 : 2015-D23-Disney-Animation :. Can You Smell What Disney Is Cooking? Last weekend, Disney fans gathered in the shadow of Disneyland to celebrate, to cheer, and to stand in long, long lines to buy merchandise. It's a lot like Disneyland, only the rides are actually promises -- promises of new rides, new movies, new games, and more. It's the D23 Expo. For an organization as finely tuned and successful as Disney is, the Expo itself had a bit of a rough start in getting attendees actually into the building. Thus the Disney Legends ceremony, conferring the status upon key people both in the spotlight and behind the scenes, ended up being only half-full in the cavernous Hall D 23 (actually the Anaheim Convention Center's Hall E). But once everyone got into the Expo itself, the panels were absolutely packed, starting with Disney Animation. Each film discussed (many had already been announced) had a little pop for the audience, beginning with Zootopia. The first trailer released to theaters really didn't pack much of a punch, just a vague introduction to the look of the characters, After Friday's presentation, though, it looks like it might be dealing with some timely themes. Ginnifer Goodwin (Once Upon a Time) will be voicing rookie rabbit police officer Judy Hopps, and as she talked about Disney's importance to her childhood, she revealed that she now lives in a house once owned by Disney giant Sterling Holloway (the original Winnie the Pooh). That would be a theme throughout the weekend. Not Winnie the Pooh, but how much being involved in a Disney production means to the talent. Some fine actors appeared, but somehow their genuine excitement and appreciation really came through. Via a taped message, Shakira announced her role in Zootopia, as Gazelle, the biggest pop star in the world of Zootopia. 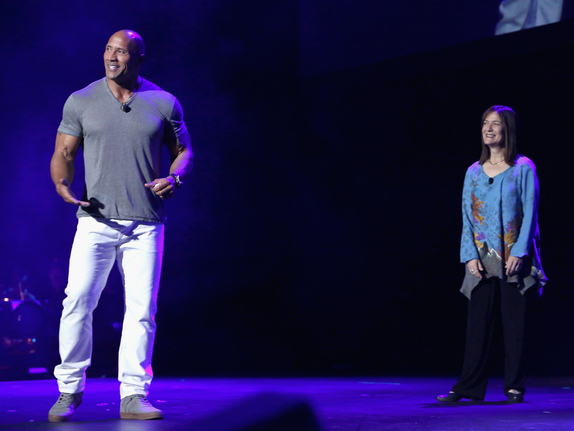 She will, of course, be singing the new song "Try Everything" in the film, which opens March 4, 20016. 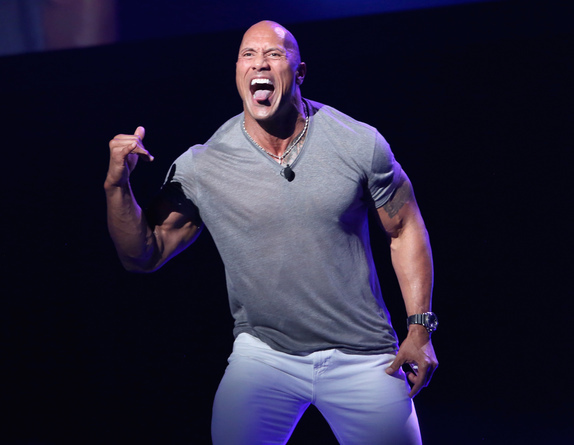 The next film under the Disney Animation banner will be Moana, which had already garnered some excitement when Disney announced that Dwayne "The Rock" Johnson would voice Maui, a demi-god seeking redemption and possibly singing in the film. Johnson came out on stage with directors John Musker and Ron Clements to talk about the film. Previous reports had celebrated the title character as Disney's first Polynesian Princess, but that seems to be selling her short. The spirited teenager seeks to finish her ancestors' unfulfilled quest -- it's a hero's journey, with Johnson's Maui as a guide. 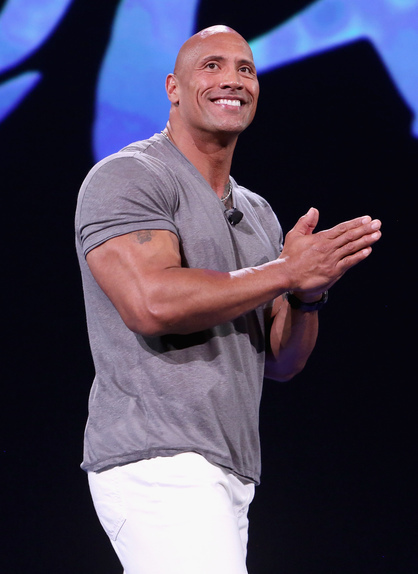 Moana has been scheduled for November 23, 2016, Disney's bid to dominate Thanksgiving weekend. Looking further ahead, Disney announced the next adjective-titled fairy tale spin, Gigantic. 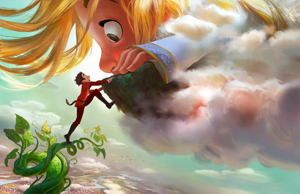 Riffing off of "Jack and the Beanstalk," the film sets the action in Spain during the Age of Exploration, since the story really is about a boy exploring a whole new land. But Disney puts a twist on it, with Jack encountering an 11-year-old giant girl named Inma. 60-feet tall and as curious about humans as Jack is about giants, Inma throws a curve in the story as we know it. Knowing when they have a good team, Disney has brought back songwriters Kristen Anderson-Lopez and Bobby Lopez (Frozen) to write a new batch of songs that your children will sing over and over. They previewed one song from the score, "My Little Man." Currently meant to be sung by Inma to Jack, who she considers a toy, it brought down the house. More than a few fans wondered why Disney hasn't actually used Kristen to sing in one of their films yet. Scheduled for release in 2018, Gigantic will be directed by Nathan Greno (Tangled) and produced by Dorothy McKim (the great short "Get A Horse!"). They did not take my suggestion to change the name to Stalked. 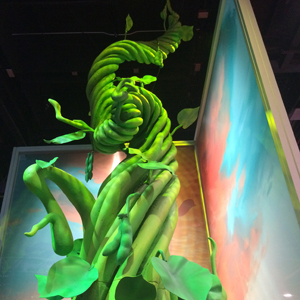 Impressively, Disney managed to add a giant beanstalk to their animation exhibit without anyone commenting. When the Expo opened on Friday, it wasn't there. By the time the panel was over at around 6, it was.